Kinda cramped in there, huh, Shogo? Like any good sci-fi concept, mecha come in all shapes and sizes. Most audiences hear the word and immediately think of the Humongous Mecha popularized by Japanese media; on the other end of the scale, we have human-sized Powered Armor, more commonly seen in Western works. But what about the middle ground? Mini-Mecha are machines too big or complex to be considered Powered Armor but not quite humongous enough to fit in the other category. A telltale sign you have a Mini-Mecha instead of a Powered Armor is the presence of a physical cockpit, typically small and exposed; if the user can be described as a "pilot" or "driver", then you have a Mini-Mecha on your hands. As the above comparison may suggest, these are about evenly distributed between Japanese and Western works, though becoming more popular in mainstream sci-fi. Compare and contrast Mobile Suit Human, where the mecha is relatively small simply due to having a really small pilot. Gall Force has the Bronze-D and Bronze-X versions of a mecha about 12–14 feet tall that the Solonoids use remote or piloted for ship to ship combat. Rideback takes place in a universe featuring motorcycles that transform into humanoid robots with their riders still riding on their backs. The Sonic Divers from Sky Girls falls somewhere between Powered Armor and Mini-Mecha; the machine's legs move with the pilot's, but the arms are controlled with a pair of joysticks. It is also Transforming Mecha (from "G" Flight Mode to "A" Walker Mode, so it makes a Transformable Mini Mecha). The various Transforming Mecha in Megazone 23, futuristic motorcycles with humanoid combat modes. Cutouts of the interior show that their combat mode is basically a motorcycle chassis surrounded by a bipedal shell. the TA's and fakes in Gasaraki, like the above mentioned Megazone23 the cockpit is so small that the user is cramped into a racing bike style position with no room to move, though this also means that in an emergency the head cowling on the TA's can open up allowing the pilot to see out. Lagann from Tengen Toppa Gurren Lagann is actually shorter than most of the adult characters in the series. Its purpose is to take control of and combine with larger mecha, though it can fight on its own. The Landmates in Appleseed are halfway between this and powered armor. The pilot's legs go into the mech's legs, and their arms jut out from the torso under the mech's arms, which mimic the wearer's. The Tachikoma from Ghost in the Shell: Stand Alone Complex are sentient Spider Tanks that can be manned, but largely operate on their own (inexpressibly adorable) artificial intelligence. They are also incredibly fast and agile, often chasing helicopters by jumping over the roofs of buildings or climbing skyscrapers. Suits similar to the ones in Appleseed exist. All of the military robots used in Ergo Proxy. The Arm Slaves of Full Metal Panic!. They're about 20 feet tall and used like any other military vehicle. The exception is the Behemoth class arm slaves, which fully qualify as humongous. The original Light Novel and Manga version versions of the Arm Slaves are even smaller at 10 feet for most AS only the Behemoth is still humongous in-verse at 20. the heights were doubled for the anime versions. Bubblegum Crisis has both powered armor and a sort-of Mini-Mecha, the DD Battlemover. Plus that MADOX thing that Mackie drives. Most of the Knightmare Frames used in the first season of Code Geass count more as Mini-Mecha than Humongous Mecha. After all, the cockpits take up a considerable amount of space, and jut out of the back of the devices quite noticeably. Some of the later Knightmare Frames (especially in season two) are large enough to be truly "humungous," however, such as the Middle Eastern League's Bamides, which are shown to be all but immune to tank rounds. Innocent Venus has the Gladiators, which are about 15–20 feet tall. While Gundam is a Humongous Mecha franchise, several of the universes have smaller machines that are typically used for civilian construction (and, in a couple of cases, building contests and races). Sometimes they're given weapons, but this never ends well. Which is kind of what you'd expect when you try to use construction equipment against actual military hardware. Every time it's been attempted has been out of sheer desperation. Ken Ishikawa's freeder bug features mecha smaller than the characters, which are controlled from a seat fixed to the back. They can also transform into neat little skimmers. Most Round Bucklers in Mars Daybreak are around 4–5 meters tall, Cordless (piloted, as opposed to the more conventional remotely controlled types) are a tad taller than that. The PPO Rs in Key the Metal Idol could probably qualify as this, despite being controlled from a separate location. The Stratos of Infinite Stratos are probably closest to this, albeit edging closer to Powered Armor territory than Humongous Mecha. Marvel Comic's Spitfire and the Troubleshooters (later Codename: Spitfire) featured a mini mecha known as the MAX. Iron Man's bulkier Hulkbuster armor has aspects of this. The Diggers from Spider-Man and Venom comics are obscure villains: mech-drivers who usually work for corrupt corporations in digging for resources in illegal areas. The AT-STs ("chicken walkers") from Star Wars. Star Wars: Revenge of the Sith has the AT-RT, which amounts to a motorcycle with chicken legs. The Expanded Universe also brings us the slightly heavier AT-PT - the PT standing for "Personal Transport". Basically, they look like a shorter and stockier AT-ST. The Matrix gives us mini-mechas which also have Guns Akimbo large caliber machineguns. The power loader suit from Aliens. Many companies were very disappointed to learn that no such product existed yet. The mecha suit Wikus Van De Merwe uses in the climax of District 9. Obidiah Stane's powersuit in Iron Man, the Iron Monger, blurs the line between Mini-Mecha and Powered Armor. It is very humanoid but much too large for his limbs to extend far out from the cockpit inside the torso. In fact, because it has a literal helmet structure, it's not a stretch to say that Iron Monger is powered armor from the neck up, and the rest is mini-mecha. The AMP suit from Avatar also walks the line; the pilot's body is entirely within the torso cockpit, but he/she directly manipulates the legs with foot pedals and the arms with servo armatures, worn by the pilot so that the AMP's larger arms follow their exact movements. The Wyvern mecha-suits from John Ringo and Travis S. Taylor's Looking Glass books are more like this than they are powered armour, despite their (roughly) humanoid shape. The warden of the titular prison has a combat exoskeleton in The Omega Cage. Luckily for the people he's chasing, he's not very skilled with it. Unsurprisingly, Power Rangers has tried this on for size, as with every other mecha trope. The unpiloted Minizord (in Power Rangers Ninja Storm) may or may not count: it seems to be intelligent-ish and basically controls the combining procedure. However, there is also the Transtech Armor (Power Rangers Operation Overdrive), an oversized-but-not-Zord-sized car that transforms into a robot mode. Kaixa's Side Basshar from Kamen Rider Faiz changes from a motorcycle into a bipedal, open-cockpit walker with tons of missiles. Kamen Rider Fourze has the Power Dizer, which turns from a mobile launch pad into a humanoid walker, which relies a lot on the pilot's constitution - Kengo is critically ill and cannot bring out its full potential. When Shun, an American Football quarterback and perfect physical specimen, befriends the heroes he takes over piloting duties. Warhammer 40,000 uses the term Dreadnought to refer to bipedal war machines larger than Power Armor but smaller than Titans. Like everything in the 40K universe, the trope is turned Up to Eleven so much that "Mini" is stretched to it's limits. Space Marine Dreadnoughts, standing between 15 and 25 feet tall, are somewhere between walking tanks and venerated tombs, piloted by a mortally-wounded Space Marine in a life-sustaining sarcophagus. Ork Deff Dreds and Killa Kans follow the Marines' example and have their Ork and Gretchin pilots crudely wired into the contraptions, while Eldar Wraithlords are graceful constructs "piloted" by the soulstone of a mighty warrior. Similar to the Star Wars scout walker examples above are Imperial Sentinels and Eldar War Walkers, both of which are open-topped, though the former has an enclosed crew compartment in its heavier version while the latter's pilot is protected by a force field. Tau Battlesuits are the smallest of 40k's Mini-Mecha, and are just large enough to fit their pilots in the suits' chests. Since they are so much smaller compared to the other Dreadnoughts, the tabletop rules count Battlesuits as infantry rather than walker vehicles. Rifts is the purveyor of countless examples, including many Triax half-and-halfs that seem inspired by Appleseed to the fully piloted Ultimax and Terror Trooper. 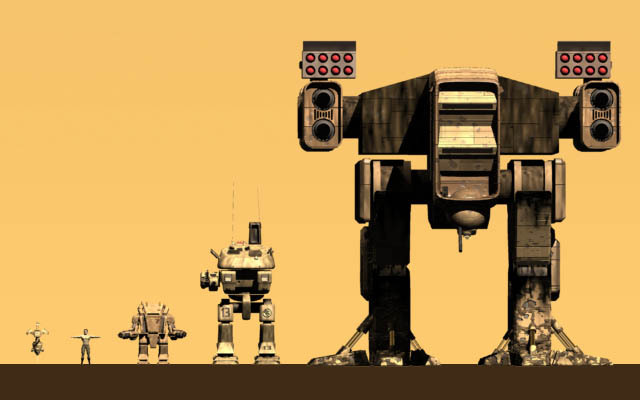 The later eras of BattleTech include Clan Protomechs, which are two- to ten-ton vehicles intended to fill a tactical gap between battle armors and light 'Mechs. They deploy in the same manner as Clan Elementals, but are piloted by warriors of the short, slight-built aerospace fighter pilot phenotype. After the Jihad, ten to fifteen (as opposed to two to nine) ton "Ultra protos" appeared, as well as alternate glider and quadrapedal chassis types. Their piloting systems are less cramped; according to the description of the Svartalfa, they can accomodate the extremely tall and bulky "Elemental" super-infantry phenotype. However, most pilots are still the fighter pilots. In Exalted, Warstriders are either this or Humongous Mecha, depending on the exact type. Heavy Gear focuses on the piloting of such mecha. As does Gear Krieg, albeit with armored car and small tanks that turn into walkers (still far smaller than the BattleTech style mecha). Warjacks tend to be about this size, though being remote-controlled Magitek weapons, they lack the pilot. LEGO Exo-Force contained two of these each year to complement the predominant Humongous Mecha, owing to the need to have sets available for a wide range of prices with these obviously fitting the "impulse" low-cost range. LEGO also had an example in Bionicle; the Exo-Toa are the kind that are like Powered Armor, but oversized. Likewise the Boxors, which were so compact that the pilots had to sit at the very front, completely exposed. The Custom Robo series. The highly destructive mecha are between eight to ten inches high, but are still piloted by humans - psychically. The President of the United States has one in Metal Wolf Chaos. It even has the Presidential Seal on one of the rocket launchers. The titular Armored Cores of Armored Core 5 are said to be only 5 meters tall. In the trailor, the Cores seem to be only a bit taller than tanks. So either this is true or those are some big tanks. The goddamned Raptors in Razing Storm. They jump around like mad while firing out Beam Spam and rockets. Steve from Dark Cloud 2 is essentially a barrel with limbs that Max controls from a seat on top of the barrel. That you can upgrade to a levitating ancient-golem-robot-thing protected by armor empowered by the infinite dance of the cosmos that shoots beams of lethal, concentrated sunlight. The Bunyips from the Ty the Tasmanian Tiger sequels are larger than most, but small enough that the cockpit amounts to a seat where the head should be. The Ride Armor from the Mega Man X series, despite its name, is really a mecha roughly twice the size of the average character from the franchise with the entire upper torso serving as a cockpit and the pilot poking out from between its shoulders. On that note, the Gustaff from the Mega Man Legends series counts as a mini-mech as well; its pilot, Tron Bonne, is notably seen piloting this machine, which is almost as famous as the Legends-era's Blue Bomber himself. In Namco X Capcom and Marvel vs. Capcom the Gustaff has an open cockpit to show Tron piloting it, whereas in the actual games the mech is larger, about the size of a minivan. The majority of the Vital Suits from Lost Planet fall into this category, though as the game progresses, larger and more heavily-armored models appear. Steambot Chronicles is set in a world where Mini-Mecha called Trotmobiles have become as ubiquitous as cars. Speed Power Gunbike is an obscure Japanese PS 1 title featuring transforming motorcycles in the vein of the Megazone23 example above. The "Wolverine" units from Command & Conquer: Tiberian Sun. They are described as "powered assault armor", but bulky as they are, fit this trope instead. Interestingly enough, they use the infantry sound clips instead of the vehicle ones. The Mecha Tengu and Striker VX in Command & Conquer: Red Alert 3, both can turn into aircrafts and back. Waffle's Police Robo and Cyan's Knight Robo from Tail Concerto. The game's Spiritual Successor, Solatorobo, gives mini mechas to several major characters. Most of the mecha in Super Robot Wars Spin-Off OG Saga: Endless Frontier fall into this category. They're a fair bit larger than a person, and are generally remote-controlled or autonomous rather than worn or piloted. They take it a little too literally too, seeing as they're really miniature versions of full-sized Humongous Mecha from the series. Special mention must be made for Hoover/Baby Head from Captain Commando: A human-sized mecha being piloted by a hyper-intelligent baby. Which, like the rest of the characters, can in turn pilot another type of mini-mecha sometimes found during the levels. Sonic the Hedgehog got into the act in Sonic Adventure 2 with Mini-Mecha piloted by Tails and Eggman, and later allowed Shadow to use similar vehicles. Also the series has GUN which uses robots like this with names like "Big Dog". Some of the Metal Slug games feature small mecha the player can use. In the second and third Jak and Daxter games have a couple missions where Jak gets to pilot a Mini-Mecha. The smaller combat Wanzers of the Front Mission series probably qualify, especially the Gaiden Game Gun Hazard's Harby, the Wanzer you start off in. It's a miracle Albert doesn't get turned into swiss cheese, since the Harby has almost no protection for the pilot whatsoever. Attacking Wanzers on foot isn't immediately suicide because the evasion rate is so high: bullets designed to punch giant holes in 25 foot tall mechs are extremely difficult to aim at a 5 foot human. Then again, the humans often not bother bringing the need of RPG/ Rocket Launcher into accounts (Justified in case of pilots). The height of the military wanzers range from 5.4 to 5.8 meters, only few of them exceed this number. Fluff indeed indicates that Wanzer cockpit is so cramped, dark and uncomfortable that one pilot said he won't have a second try. Front Mission Evolved has the same relative proportions between Wanzers and humans as in the third game but the FMVs display an incongruously spacious cockpit- as in, the pilot actually has space to stretch his/her arms. Footsloggers do get an anti-armor weapon this time though. Likely an in-universe case of Tech Marches On, Cockpit in FM 3 cutscenes are almost as spacious as the one shown in Evolved (in case of work loader/ construction wanzer, actually larger and spherical). 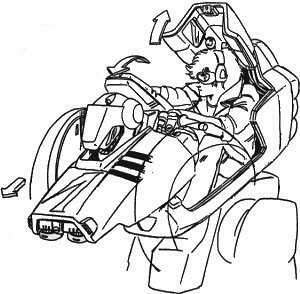 The Statement that Wanzer cockpit is crampy and uncomfortable is from Front Mission 4 novel -Elsa-, which is set in 2090s. FM 3 is set in 2112 and Evolved is in 2173. 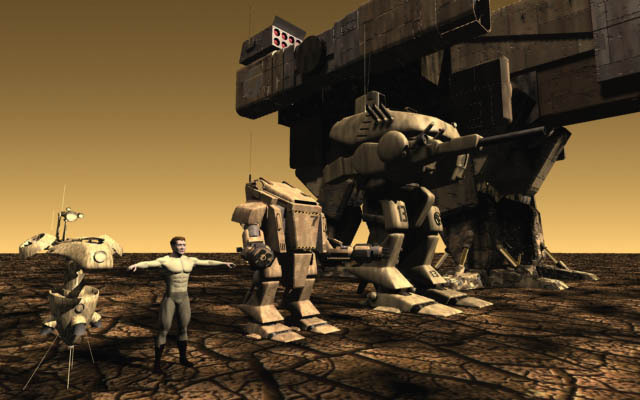 The AGWS (pronounced "Eggs") of Xenosaga Episode I—4 meter tall mechs designed to operate inside of starships. Their full scale cousins, AMWS (pronounced "Aims") and ES appear in Episodes II & III. Giacomo's walker from Rise of Legends treads the line between this and Humongous Mecha. Supreme Commander has all of the factions getting Mini Mecha in their Tier 1 units. They progressively get larger with each level. The true Humongous Mecha of the series are the ACU/SCU and some of the experimental units, notably the Siege Assault Bot and Cybran Monkeylord, although both pale in comparison to the ACU/SCU. Phantom Crash's Scoobees are only slightly larger than a car. In Metal Gear 2, Dr. Madnar mentions the development of Metal Gear G, a small-scale, mass produced, and moderately armed walking tank designed to assist infantry by processing real-time combat data with advanced sensors and transmitting that info to the troops. Although they were cut from the game due to time constraints, its influence is seen it the unmanned Gekkos and the SOP system. The R.E.V.-6s in the first game. StarCraft has the Terran Goliath and the Protoss Dragoon, a rare non-human example. The sequel brings the Goliath back as a single-player extra, featuring the new Terran Viking, Protoss Stalker, and Protoss Immortal mini-mecha in starring roles. The Makron's Jorg mecha (in between this and Powered Armor) in Quake II, and the Strogg Walker in Quake IV. The Battle Armor in Red Faction II. A level in Killzone 2 lets you pilot a Helghan battle suit complete with arm-mounted chain gun and rocket launcher (curiously they never use anything like it against you). Rocket Knight Adventures has several varieties of enemies that pilot these. The German Exoskeletons of War Front Turning Point are these, being roughly the size of a vertical tank. The Silverback in Gears of War 3 has a misleading name as its back is whatever color a Gear has on his or her guns. That is to say, the pilot's back is fully exposed. The design does allow for a quick exit and its intended pilots do retain their back armor, and in the end the entire point may have been to make that heavy machine gun portable. Advanced Strategic Command has "mech troopers" that counts as light tracked vehicles (immune to razor wire and snipers, but stopped by anti-tank obstacles), armed with miniguns, better Anti-Air missiles than infantry, etc. Between their sprites, ability to conquer buildings and fit in APC, twice weight and armor better only by half than that of heavy infantry, these look like weaponized power loaders, of the sort seen in Alien, not Power Dolls. Generally they are slow Glass Cannon units much more expensive than soldiers and weaker than proper vehicles, but can be very useful due to combination of infantry and tank features. Pac-Man pilots one as a Guest Fighter in Street Fighter X Tekken. Kid Icarus Uprising features a few different models, called "Cherubots". The Great Sacred Treasure is a transforming variant of this. In League of Legends, The champion named Rumble pilots one, which, according to his lore, he built out of junk after mysteriously disappearing. Cerberus ATLAS mechs in Mass Effect 3. Shepard can drive them either by finding an unmanned one or shooting out the cockpit and gundam-jacking it. Worn by the Giant Mooks on the third planet in Alien Hallway. Several mechs found in Girl Genius, such as the one Dr. Silas Merlot used to try and kill Agatha in Castle Heterodyne. The mantis walker built by Gil (when he was a kid) and piloted by Zoing. Inscribed with "Arthropodi rule!" and "Who's the lab rat now?" Tausennigan mini-tanks, found in Schlock Mercenary. Designed for O'Benn, small enough that only the shortest human crew members (or smaller non-humans) can effectively pilot them, and mounting a pair of arms that haven't yet been seen in action (plus the tank cannon), they seem to qualify. On the other hand, they fly instead of walk. A mid-sized mech appears in Jayden And Crusader. It's about the size of a house. The LIMBS of My Life at War qualify as mini-mechs. 4mb3r, in Sequential Art, pilots one starting here. Dexter's backpack expands into one of these in Dexters Laboratory. Teenage Mutant Ninja Turtles 2003 series has several of these, the main one being Cody Jones' two Turtle X mecha. Others include the Foot's Shred-naught Units, and the core mecha used by Justice Force members Dr. Dome and Ananda. The Utrom Shredder himself uses what could be described as one in the episode, Exodus, where after his main body is destroyed, he is placed into a much larger, more heavily armed (literally; he's got four of them in this thing) suit. The Exo-frames from the Exo Squad ranged in design and functionality from Power Armor to these. Sheldon from My Life as a Teenage Robot uses one of these called the Silver Shell. The Batman saw Batman build a mecha suit in order to fight a Venom'd up Bane and kept it around just in case. He later used another one against Superman when Supes was under Mind Control. In Batman the Brave And The Bold, the Batmobile actually morphs into a Mini-Mecha (and a plane, and a boat, and a submarine...). The White Knight uses one in an episode of Generator Rex. While wearing powered armor under it. The Legend of Korra has mecha-tanks. They were built by Hiroshi Sato for the Equalists. Pretty much any machine that moves by walking qualifies. Considering how you stretch it, vehicles in general could qualify as well but that's not the spirit of the trope.